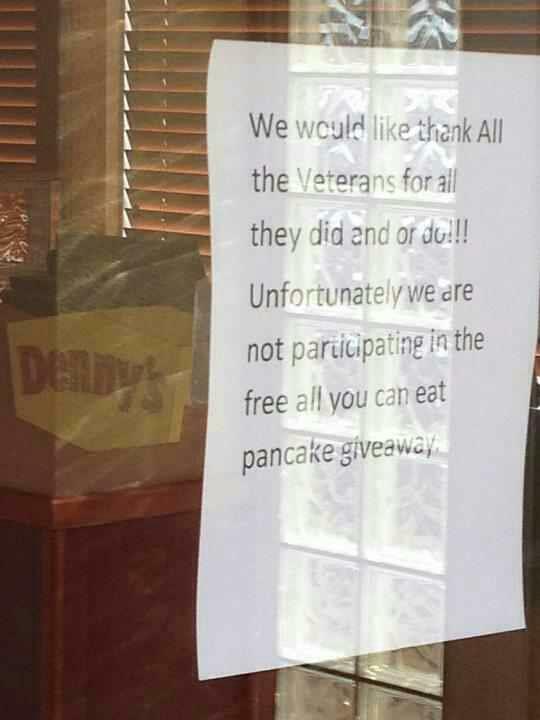 There’s scandal and mystery surrounding the Denny’s in North Pekin, IL, today after a sign appeared on the restaurant’s door saying it wouldn’t be honoring the previously advertised pancake giveaway for Veterans Day. But the restaurant says it has no idea who put that sign on the door. We would like to thank All the Veterans for all they did and or do!!! Unfortunately we are not participating in the free all you can eat pancake giveaway. When I contacted the Denny’s, I spoke to an employee who was mystified by the sign. He claimed that it was not a store employee who placed it on the building and that this particular restaurant will likely be re-running the promotion tomorrow during the same hours (6 a.m. to 2 p.m.) to apologize for the confusion. The promotion, which happened today instead on the actual Veterans Day because most government employees have today off in observance of the holiday, offers all you can eat pancakes to active, inactive, and retired military personnel. UPDATE: The story just got even more confusing. That is just one of several examples where Denny’s Facebook account tells people that all restaurants are supposed to participate. We’ve gone back to Denny’s HQ with a request for clarification.